Arctic ice is melting, diluting the salty seas with freshwater and, many suspect, weakening the ocean currents that help regulate the global climate by transporting heat around the globe. If these currents were to shut down, the consequences would be unpredictable and dire: immense loss of marine life and fisheries; a reduction in the ability of the ocean to remove greenhouse gases from the atmosphere; and, some scientists speculate, drastic cooling of Northern Europe. Make more Arctic ice, and make it salty. Under normal conditions, warm-water currents like the Gulf Stream carry heat from the tropics to Europe. After a current releases its heat, the water sinks (cold water is more dense than warm; salty more dense than fresh) and flows back to the equatorial regions along the ocean floor. This sinking is the engine that powers global currents. But in one apocalyptic scenario, melted Arctic ice dilutes the water in the North Atlantic to the point where the tropics-bound current isn't dense enough to sink. The heat-carrying currents skid to a halt, and Europe enters a new ice age. making barges to the Arctic, and make a salty ice cube the size of New Mexico. In this plan, the barges would arrive off the coast of Greenland in the fall. 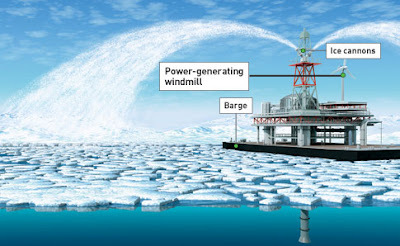 As winter set in and air temperatures fell below 14F, wind-powered water pumps on the barges would shower salty seawater on top of the existing ice pack, creating new layers of extremely salty ice. Come spring, the barges would boost the currents by spraying more water onto the newly formed saline ice pack. As it melted, the cold, dense, salty water would sink into the deep ocean. The result: a 6 percent increase in down-welling currents, enough to keep the system moving along. Flynn does not advocate implementing this solution now-only if the slowdown reaches a critical threshold (what that threshold is and when it may occur is still in question) and only if all else fails. It's not a plan B, he says; it's a plan D. Instead, a better course of action would be to ensure that the down-welling currents and ocean conveyor belt not be suppressed in the first place. Powering Homes With Wireless Energy From Space. Insulating Glaciers to save earth. What next for Desktop PC? Linux Mint 7 ‘Gloria’ XFCE released! Audi Calamari ,The flying Car. A faceless watch which still can tell time! What’s next for Yahoo and Twitter?